Weather is changing, time to get a thicker wetsuit! Beach has been gorgeous and Kelie had a great time on Monday with the boys. They found a baby octopus in a big chunk of seaweed and got to hold it! New Weaving and Spinning Classes at Common Threads: Call the store to sign up! Cheryl Groyer, who is an expert weaving and fiber enthusiast, will be teaching a beginning weaving classes. Students will be using the Cricket ridged heddle looms available at the store to make there first woven scarf. Looms are free to use for the class and if you decide to keep yours, it will be discounted 10% off the retail price. Kelie Oreb will be in the house, Common Threads house that is, to share her spinning wisdom with anyone interested in learning the basic skills necessary to spin on a spinning wheel. Students will be spinning on any one of the spinning wheels on display at Common Threads. If you have a spinning wheel, by all means bring it to class. We talk a little about the difference between a single drive and double drive setup on the wheels. Common Threads has 3 wheels – Louet Victoria, Louet S17, and the Ashford Traveller. Look for a Learn to Knit Socks class after the New Year! 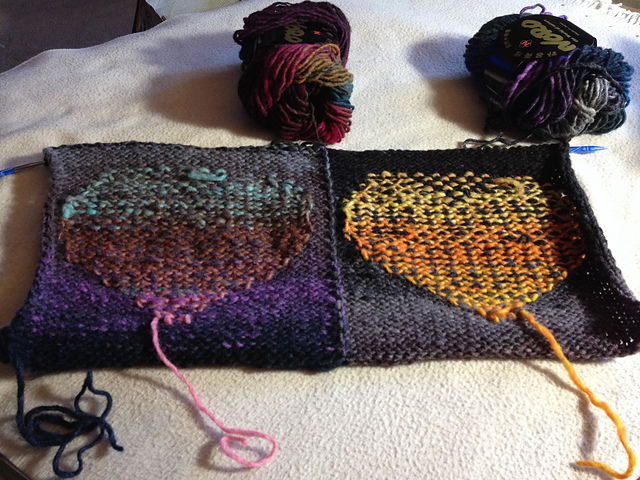 Nancy – about 1/6th of the way done on her I Heart Noro blanket. Currently working on Hitchhiker shawl by Martina Behm using Schoppel-Wolle Gradient. Kelie – Finished her Mermaid Cowl made with Handmaiden Sea Silk. 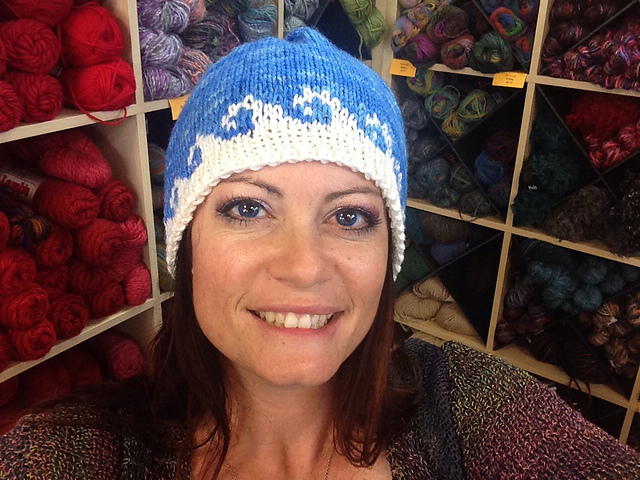 Special thanks to Stacy for agreeing to moderate our Ravelry group! No waves to ride this past week and the water temperature is dropping, starting to feel the season change! Kelie’s Project – New Towne Sweater from Custom Fit by Amy Herzog. The yarn is Anzula Cricket in the Black Cherry colorway. All the pieces are knitted and the blocking has started. We discuss the different reasons and methods of blocking. I Heart Noro blanket. 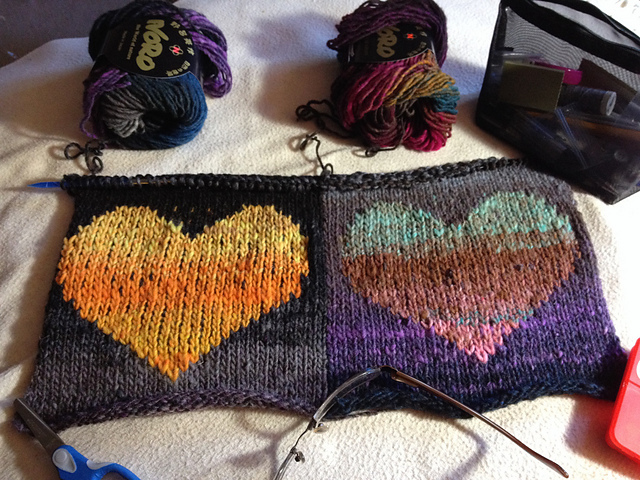 We talk about carrying the yarn behind the heart and the color changes for each block. There will be 3 panels with 2 squares side by side so there will be less seams to finish in the end. We talk about Nancy’s Textile class at Fashion Institute of Design & Merchandising (FIDM). The school is part of a Project Runway: Threads television show on Lifetime. The ocean is still treating us well with it’s generously warm waters and good waves! Today’s podcast featured The Cardiff Kook in Encinitas. His Facebook page is located here. Created by Hemet sculptor Matthew Antichevich under a $92,000 commission from the Cardiff Botanical Society, the sculpture was installed three years ago just outside the San Elijo State Beach campground. Critics immediately blasted it as effeminate, not enough like a surfer — more a ballet dancer than a macho rider of waves. Since its installation in 2007 along Highway 101 in Cardiff-by-the-Sea, the statue named “Magic Carpet Ride” by its creator Matthew Antichevich has taken on many faces. Much discussed & maligned, eaten by ‘Jaws’, crowned with a pumpkin head, and dressed as everything from a clown to Zorro – the delight and debate that is the “Cardiff Kook” happily rages on…The Cardiff Kook occupies a prominent piece of real estate near some of the most popular surf breaks along the San Diego coastline. Once erected, both surfers & non-surfers immediately began chiming in over what many agree is a poor representation of the ‘true’ surfer form. Perhaps it’s the limp wrists, arms splayed in a strange manner, ’stink-bug’ stance, or portrayal atop a sputtering spray – instead of an epic wave… The Kook has heard it all, and has since become the target of pranksters far and wide. Knitalong: Creature Comforts Cardi – See picture of Joni modeling her finished Cardi, so beautiful! November guild meeting: San Diego North Coast Knitters Guild – Topic was philanthropy, check out their good work here. Thank you to Julie for sharing the Old Poway Park yarn bomb project on the podcast! Torrance Fiber Festival: Southern California Handweaver’s Guild puts on an amazing annual Weaving and Fiber Festival at the Torrance Cultural Arts Center. It’s a fun one day show with great vendors and wonderful drawings. Always a good time! Here is our video demonstrating 3 different Styles of Knitting! We started off our morning by enjoying a glass of Kelie’s home-brewed Kombucha. If you’re interested in learning more, here is a favorite link – Cultures for Health. We discuss a Common Threads custom yarn dyed for the shop by Mountain Colors. The yarn is called Twizzle by Mountain Colors and is 85% Merino, 15% Silk. If you are interested in ordering a skein please call us at (760) 436-6119. Welcome to the first podcast from The Knit Surfers! In this episode we introduce ourselves and discuss the new location for the store. We talk about how Common Threads came to be and the history behind the store. We celebrate Nancy’s 50th birthday AND Common Threads’ 20th birthday with cake and ice cream. Nancy is almost done with her Creature Comforts Cardi by Madelinetosh. This project is the current knit along at the store where there are 26 other knitters working together. They are two weeks in and are doing great! Please leave us comments/suggestions, we would love to hear from you! Do I need to knit a swatch? Your answer depends on what you are trying to accomplish. If you have purchased a new yarn and you want to figure out what needle will give you the best fabric for your project, then you will definitely want to knit a swatch. Start by looking at the ball band to find the needle the company who made this yarn recommends. Many times they will have a range of needle sizes. The biggest needle will give you a fabric closest what the manufacture believes is suitable for a sweater. The smallest number is what is best for the ribbing bands. Also be aware that if the yarn is made in a European country such as Italy or Germany, most likely the needle is labeled in millimeters. This is a different sizing system to our US needle size system. For example a US8 needle is a 5mm needle. Some European companies do not print the “mm” with the number, but instead only print a number 5. In these rare cases it will be important to look at the whole yarn label to notice if most of the information on the lable is written in a foreign language, if so, you can deduce the needle number is a millimeter not a US needle size. When you want your fabric to be extra loose or firm, you need to knit a swatch to not only discover the feel of the fabric, but to determine which needle size gives you the fabric drape you want. So, your a new knitter. That may mean you still don’t know if your tension is tight, loose or average. Most new knitters do not have consistent tension until they have completed two or three projects. Even still you many not have confidence in how you will knit with a new yarn, so making a swatch will give you practice and confidence before you begin your project. When a special stitch design is used for your project it may be necessary to knit a swatch in this stitch design to determine if your execution of this stitch will match the tension of the pattern. Making this swatch will also give you a chance to practice this stitch and work out any bugs or difficulties you might have when knitting this stitch pattern. It is important to note here that the tension written on the yarn label is always in stockinette stitch, and never in a special stitch design. Stockinette stitch is a fabric that has all the knit stitches on one side of the fabric and the purl stitches on the opposite side. Stockinette stitch tension is the standard for all tensions written on yarn labels. This is probably the most important reason you will want to knit a swatch. If the yarn you have chosen is bigger or smaller than the yarn suggested for the pattern, and you use it to make the sweater, then the end result will also be a bigger or smaller sweater. It is ok to choose a different yarn than the pattern, I change yarns all the time, but be prepared to adjust the stitches and rows in the pattern. Sometimes, when the yarn is just slightly different to the pattern, you can simple choose a larger or smaller size to knit and that will solve your problem. No matter what your approach is, if you have a different yarn, you will want to calculate how many stitches you will need to achieve the widest part of the sweater. Usually this is the bust measurement. This requires a few mathematical steps, and if you are afraid of math, here is your chance to make math fun. It is knitting after all. The bigger you make a swatch the more accurate the tension calculation will be. I recommend making a 26 stitch swatch. Cast on 26 sts, knit 3 rows, Row 4 – K3, p20, k3. Row 5 – knit. Repeat rows 4 and 5 nine times more, for a total of 20 rows of stockinette stitch. End with 3 rows of knit (garter st.) and cast off loosely. Yes – you need to knit this whole swatch and not part of it. Once it is off your needles you will measure across the center of the swatch, just inside the garter stitch boarders and write down this measurement. The garter boarder is helpful to keep the edges from curling to make measuring more accurate. You might be wondering at this point if all the swatches I make are 26 stitches. You could be wondering this since the ball band tension that is printed on the yarn label has a different number such as 20 or 22 or 18 stitches equals 10 cm (4″) square. The answer is, yes, my swatches are all most always 26 stitches. The only exception is when there is a stitch pattern that does not go into 20 stitches. The swatch should be a good representation of what your project will look like. If I need more that 26 stitches to see the pattern repeat than that is what I will make. The 10cm by 10cm square swatch, which to americans is a 4″ by 4″ swatch is a standard all yarn companies use to communicate stitch size to the consumer. It does not mean you need to make a swatch that is 4″, rather it is the standard calculation you use to determine how many stitches are per inch when using the recommended needle on this yarn. For example; when a label states 18 sts = 10cm. that means this yarn will knit 4.5 stitches per inch. That is 18sts divided by 4″ = 4.5 spi. Yes this requires some math, but it is knitting math, and that is much more fun than regular math. Lets say the center 20 stitches of your swatch measures 5.25″. We will divide 5.25 by 20, which equals, 3.8. That means you are knitting 3.8 stitches per inch with the selected needle. Now that you have this information you need to see how this tension compares to the tension listed on your pattern. Lets say the pattern requires a tension of 3 sts per inch. 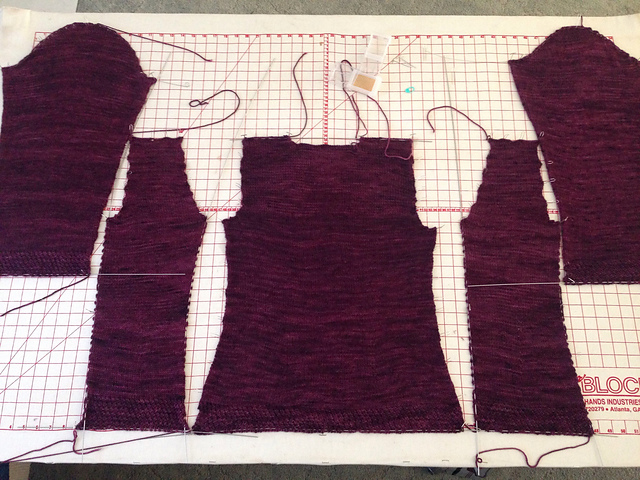 And lets say you chose the size small (36″), the back, which is half of the whole sweater, asks you to cast on 54 sts. If you cast on 54 sts in your gauge of 3.8, the back will measure 14.2″ for a total chest of 28.4″ and the sweater will be too small. But if you look at the x-large (45″) of the pattern, the back cast on is 68. If you follow this size for your sweater, it will measure close to 36″. Take 68 sts divided by 3.8 equals 17.8″ times two is 35.7″ finished sweater.